Patchwork Patterns Vary From Picture. Both Front And Back Have Patchwork Design. Hippie clothes. Bohemian clothing. Artsy clothing for creative people who aren't afraid to show a little color! 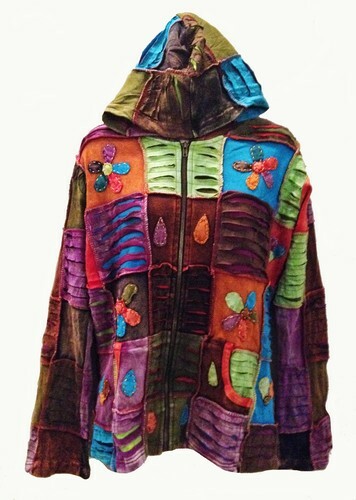 100% Stonewashed Cotton Applique Razor Cut ethnic patchwork hoodie jacket with embroidery. Zip Front two pockets. Both back and front of jacket have patchwork designs, unlike other jackets which are plain on the back. These garments are individually handcrafted and hand dyed using natural dye. Each garment is distinctive and made specially for you. Garment to garment variation in color is the natural and unique characteristic of this excellent product. Stonewashed fabric has different shades of color and white areas as well. This is the natural process of stonewashed garments. Because of the handmade nature of these garments, sizing, color, pattern, and fabric swatches can vary from item to item. The measurements represent an average of this particular item. The item in the photo is NOT the exact item you will receive. Colors will vary from picture but all jackets have the same look and feel. Check the measurements below. My jacket arrived today - I just love it! I wear a size 10, ordered the XL based on the measurements shown and the fit is perfect so I would say they run a bit small. The craftsmanship is beautiful, can't wait for the compliments when I wear it! Many thanks - your price was great as well as the shipping. Peace to all!